The cheeks are often associated with youthful beauty and health. They provide balance and help to fill out the middle portion of the face. In our youth, our cheeks are fuller. As we age, the fat pads that fill out our cheeks and give them their plumpness, change position and fall. They can even flatten out and disappear, giving the face a caved-in or sunken appearance. Once this happens, the supportive or connective tissue beneath the skin erodes and the face becomes thin and flat with little or no definition. Deep depressions, smile lines, and wrinkles appear. There are several ways to resculpt the face and fill out the cheeks. 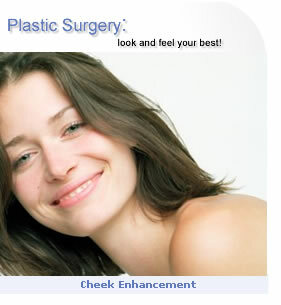 Fat injections (also called liposculpture) use the patient's own fat to fill in areas of the face. Other options include collagen injections, hyaluronic acid injections and the use of soft filler materials (implants) such as Gortex and Softform.